It’s funny what inspires a person come dinner time. A friend of mine recently gave me a bag of cashews. No, she did not give me an empty bag of cashews. I just forgot to take the picture until it was too late! I get focused on the cooking and forget to take the pictures. I remembered that I had a couple of chicken breasts in the fridge-viola! Cashew Chicken! Now, how do I make cashew chicken? Rather than paw through my cookbook library, I headed straight to the internet. I found a recipe that only called for things I had. I quickly scribbled down the recipe. Why didn’t I print it out? duh. Oh, I remember now, that was when I was out of ink. You’ll be happy to know the ink cartridge has since been replaced. Well, shame on me. I failed to jot down the website. Bad Blogger! Shame! I tried to search for it again, to no avail. So, I am sorry, person who posted this recipe. If I find you again I will include you here. 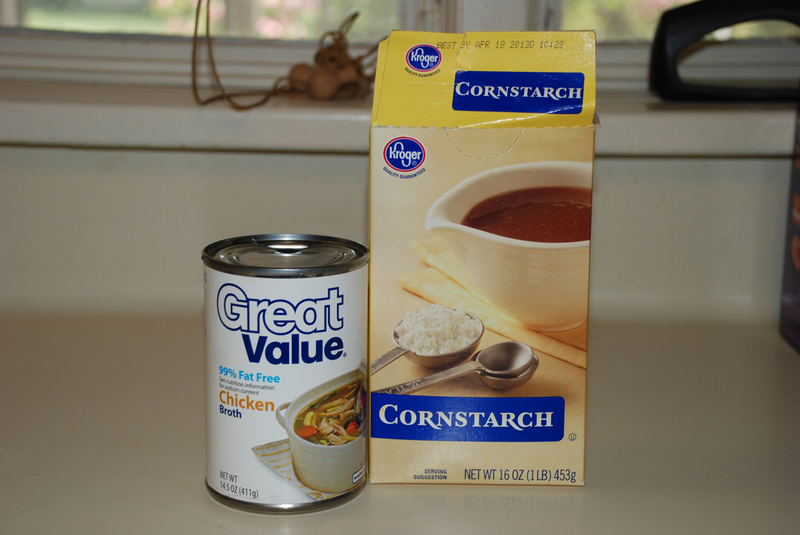 Combine chicken broth and cornstarch. Set aside. 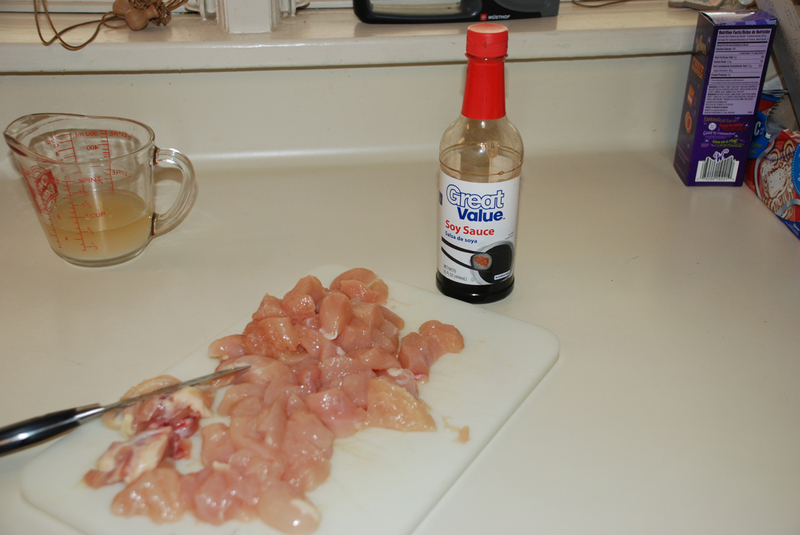 Cut up the chicken and toss it in a bowl with the soy sauce. Saute the cashews in 2 Tablespoons of oil. 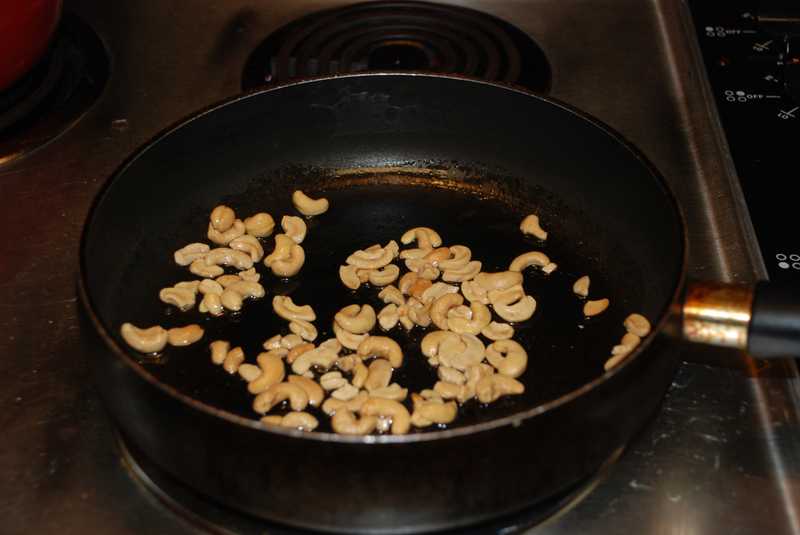 Remove cashews from pan. Cook the chicken until done. Remove from pan. But put it in a little bowl or something. You don’t want to wipe off all the soy sauce yummy. 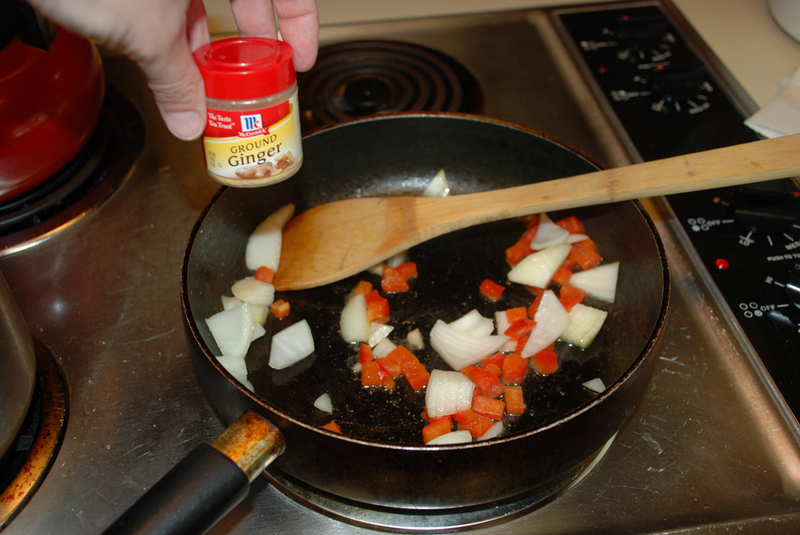 Add remaining tablespoon of oil to pan with onion, peppers and ginger. I think the recipe called for green peppers. Use what you like or, in my case, what you have. 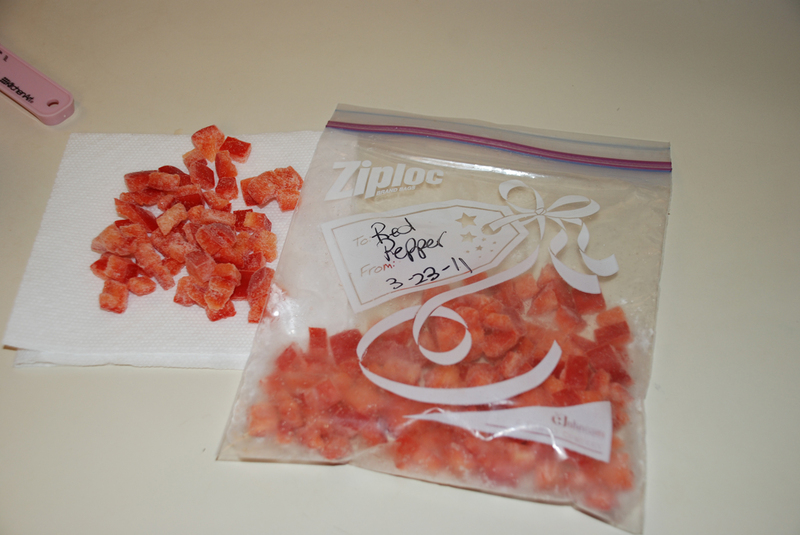 Luckily, I had these babies in the freezer-woo hoo! I thawed them a little. I don’t think they were completely thawed when they went in the pan. 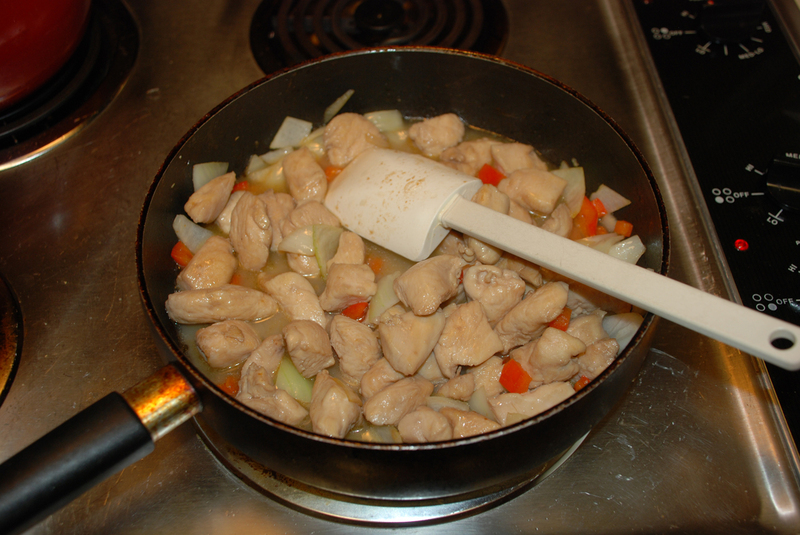 After the veggies have cooked a little, throw the chicken back in the pan. You don’t want to cook the veggies so too long. They are going to cook some more in a minute. Pour the broth over the chicken/veggie mixture. Stir to thicken. Stir in nuts. I cooked up a pot of linguine and added the noodles to the thickening sauce. 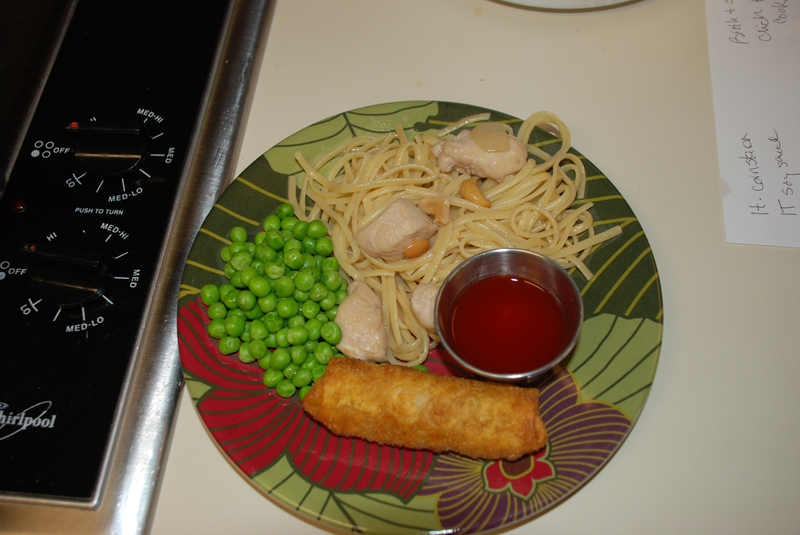 Some frozen peas and a quick trip to the local Panda House for egg rolls and dinner is ready! A fancy plate always makes a new dinner menu more appealing. 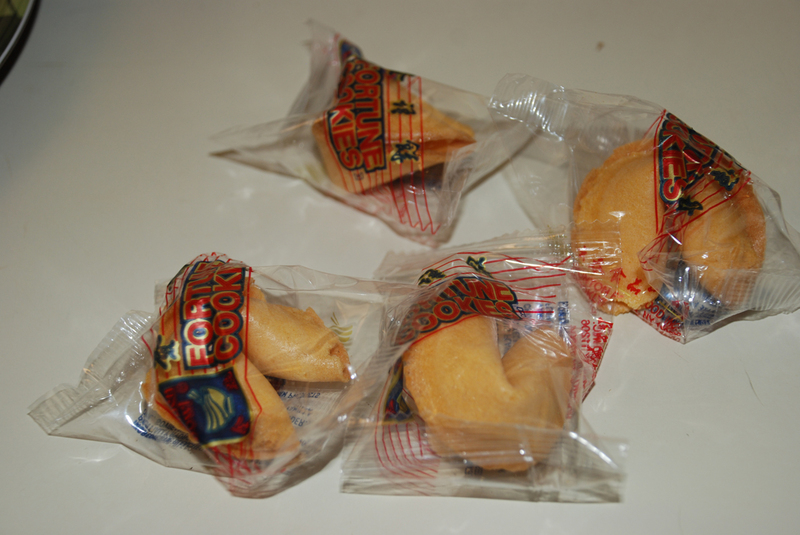 No Asian feast is complete without fortune cookies! Chip: I loved this. You can eat until you just can’t eat any more and an hour later you can have more-how cool is that? 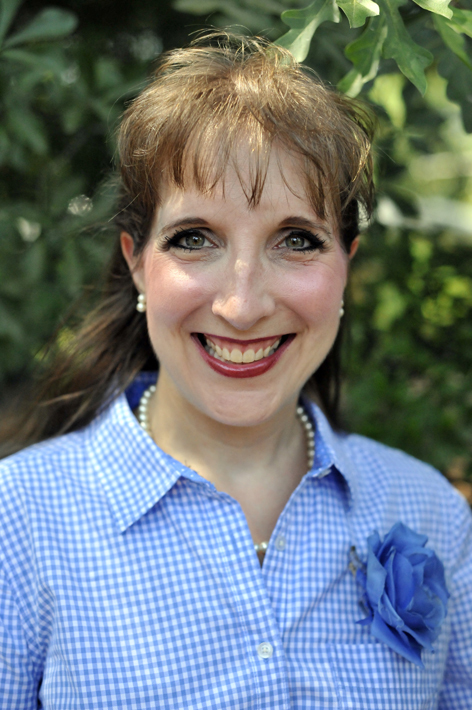 Megan: I like the Cashew Chicken better than any Chinese food I’ve ever had (save for fortune cookies & eggrolls). Katie: I liked the Cashew Chicken, but I like it without the cashews.